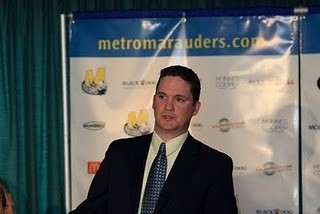 Most recently Ryan has been the Head Coach and General Manager of the Metro Marauders of the MHL. Previous to this he was Head Coach of the Pictou Crushers of the MJHL. He certainly has an impressive list of qualifications and he will certainly need to draw from them as he looks to rebuild the 3 and 25 Tommies of 2010-11. Here is a quick look at some "Honors, Awards, and Special Recognition" Troy Ryan has received. - Guest coach for Team Canada at the 2003 World Junior Hockey Championship in Halifax. Good pick up for STU.